OBC is delighted to welcome our new Associate Editor, Professor Santanu Mukherjee, to the Editorial Board. Santanu started his career in chemistry at R. K. Mission Residential College, Narendrapur, India, obtaining his BSc in 2000. He went on to study for his MSc in chemistry at IIT, Kanpur, 2002, before joining Professor Albrecht Berkessel at Universität zu Köln for his doctoral studies. After completing these in 2006, he worked as a postdoctoral fellow with Professor Benjamin List at Max-Planck Institut für Kohlenforschung in Mülheim an der Ruhr until 2008 and with Professor E. J. Corey at Harvard University from 2008-2010. 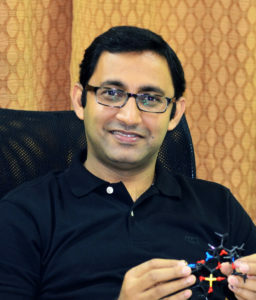 In 2010, Santanu returned to India to join the Department of Organic Chemistry at Indian Institute of Science, Bangalore as an Assistant Professor and was promoted to Associate Professor in 2015. His research interests focus on asymmetric catalysis, with a particular emphasis on the discovery of new enantioselective transformations, and recently, on iridium-catalyzed asymmetric allylic substitution reactions. To find out more about his research interests, you can visit the group webpage.